IPG UM tapped Ted Moudis Associates to dramatically transform its Manhattan HQ from a traditional office model to an agile workplace–but the challenge was doing so on a budget. The solution was to retain strategic existing spaces and remove or rebuild other areas. Existing offices were maintained but converted to new meeting rooms that better supported agile workplace needs. Ted Moudis Associates also created small, distinct “neighborhoods” within the expansive footprint to reduce the scale of the space and provide self-sufficient team work areas. Each neighborhood is entered via a “portal” that announces its name for way-finding purposes and a sense of place. In order to create a distinct environment, the entire perimeter of the floor was gutted, the ceiling left exposed and clusters of decorative lights added. This new, more relaxed work area provides an additional place for staff to work in, with a variety of work styles ranging from traditional desks, standing height high-tops, lounge seating and even oversized daybeds. “The creation of small, distinct ‘neighborhoods’ … helps employees navigate the office’s expansive footprint, and adds color, depth and functionality to the space,” said Jeff Knoll, a design director at Ted Moudis Associates. Image courtesy of Garrett Rowland. Drinks are served at 5 p.m. at the in-office speakeasy. Image courtesy off Garrett Rowland. It fluctuates on a regular basis. Existing offices were maintained but converted to new meeting rooms that better supported agile workplace needs. Additionally, a large screening room allows UM to host more informal presentations to clients in a relaxed atmosphere, while also providing a space for internal meetings and screenings. Bordering the office’s townhall are banquette booths, which provide staff alternate work areas for working or meeting. There are a variety of places employees can work in the new offices. Image courtesy of Garrett Rowland. Screening room, townhall, banquet booths, Coca-Cola bar, Sky Lounge, café, and a Speakeasy. What is the projects location and proximity to public transportation and/or other amenities? The offices location provides easy accessibility to subways, PATH trains, and buses. An executive committee was involved throughout the entirety of the project/process. The “Sky Lounge,” a white space with cloud graphics throughout, applied in such a way to create a surrealist play between reality and illusion. Stepping into this area, staff can enter a new world in which to work. Image courtesy of Garrett Rowland. The project began with high level concepts and “storytelling” and progressed in imaging sessions and several design presentations. All employee input was provided by the executive committee. Screening room with glass garage door; a Coca-Cola bar; a café with prep kitchen. Many meetings revolved around healthy food choices; preparation in the design of the staff café. TMA received the 2018 Commercial Interior Project of the Year from CoreNet Global New York City Chapter, for the design of IPG UM’s headquarters. Image courtesy of Garrett Rowland. Allowed custom graphic to be applied to wall and adjacent millwork to create continuous graphic effect (and was cost effective). Graphics create a big impact and easily transform a space. One of the client’s main branding concepts is to create ‘moments that matter’–moments that become starting points for conversations, moments that create memories, moments that make us smile. In this spirit, TMA created a ‘Sky Lounge,’ a white space with cloud graphics throughout. The graphics are applied in such a way to create a surrealist play between reality and illusion. Also, a branded Coca-Cola bar was created allowing guests and staff an alternate area to collaborate. 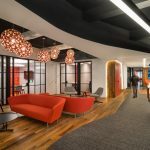 TMA used clusters of decorative lights to brighten IPG UM’s new offices. Image courtesy of Garrett Rowland. A large screening room allows UM to host more informal presentations to clients in a relaxed atmosphere. In addition, it provides a space for internal meetings and screenings. The room can expand by means of a glass garage door that opens up to the adjacent townhall space. Wellness rooms and relaxation rooms. We have cameras to link separate townhall meetings to create larger meetings; video conferencing; and front screen projection on oversized screen. A big café provides a space for constant daily use, not only for meals, but for small meetings, large presentations and townhalls. Image courtesy of Garrett Rowland. Serving as a focal point for the space is a townhall, a college-quad-like area, with moveable furniture that allows for casual meetings for groups of all sizes, and circulation to cross into other areas of the office. Image courtesy of Garrett Rowland.